Paint.NET 3.35 … "ugly" canvas background? "The top-to-bottom grayscale gradient on the desktop area of Paint .NET (3.30 in my specific case) can cause serious toning misjudgments. I didn’t fully appreciate this until a colleague pointed out how much it was throwing him off, i.e. printed results didn’t seem to match on-screen results due to improper relative corrections applied to the top and bottom areas of images, say sky vs. ground. It seems that the plain uniform gray background in Photoshop is actually pretty important." Similarly, I think it looks fine in the other built-in XP themes, especially "Classic". I was trying to honor the system color choices, but a few other forum members have expressed a very strong opinion that the canvas background should be a static (or configurable) color that is not based on the system theme. It got me to thinking, and I realized that I didn’t fully parse the original statement about the gradient versus a plain gray background. In fact, I’m now convinced that basing the canvas background on a system color is a bad thing. The reason for this has to do with color calibration between systems: if the canvas background is grey on one system, but off-white/yellow on another, then it could throw off a person’s perceptions of colors between the systems. Or, two different people on two separate but differently configured systems would perceive colors differently (all else being equal of course, such as the monitors’ color reproduction). Gray is a neutral color, and won’t have much of a radiosity effect than colors with hue. Well, what do you think? Is the new canvas background in 3.35 ugly? Would you rather it be a solid gray on all systems regardless of theme, such as in the Vista screenshot above? 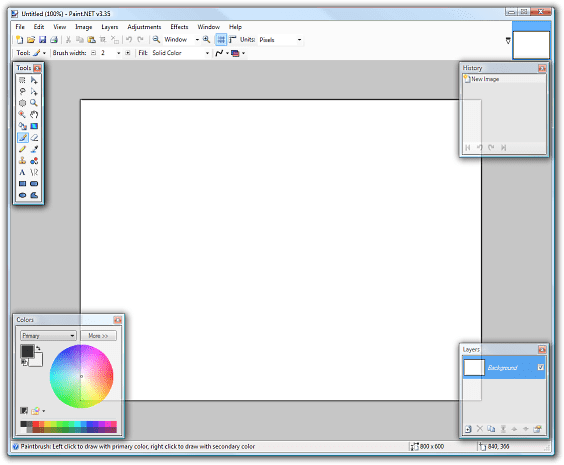 In the forum post mentioned above, I have made a available a replacement PaintDotNet.Core.dll that sets the canvas background to #c6c6c6 regardless of the system theme. If you’d like, you can try it out before commenting! That DLL will not work in future versions of Paint.NET, however. Paint.NET v3.35 final release now available! That background needs to act not unlike a gray card, and as such should be completely without colour. To be honest, I don’t think the olive colour is all that “ugly” — at least not give the colours of everything else on the screen. However, as I understand it, the colour “should” be SystemColors.AppWorkspace. This is the colour of the background in MDI applications. In the “Appearances” control panel applet, you can adjust it via the “Application Background” setting. I’m not sure how it looks, but I’m pretty sure it would look almost the same for the standard themes as what you’ve already got. If Jelle Mees (who was, frankly, rather rude… you gotta have thick skin, I guess :p) doesn’t like it, at least it can then be adjusted accordingly. Blah! Why would you want such a colour scheme. However, I agree that the canvas background should be the same on all computers, no matter what the colour scheme is. It should be solid 50% gray all the time, non-configurable to protect people from their own mistakes. Because it indeed acts as a gray card, a reference point for judging colors. This way a user can work right to the edges with light or dark shading and drop out or bump up the contrast of the canvas itself to make the work in progress ‘pop’ for review. Enabling a user to custom pick any colour other than monochrome should they need/prefer to and also quickly jump back to defaults. The slider would in this instance change the saturation of the custom coloured canvas instead. A visible/editable percentage value for this slider would help usability where precisely duplicating canvas settings between installations is needed. That’s my idea, if it’s of any use to you, do please run with it. In addition to the background (my vote is 50% grey), I find the drop shadow around the image to be a problem. When you are pixel manipulating very small images, the drop shadow gradient can make things hard to see. Perhaps a preference toggle for this, too? Regardless of the merits of a gray background over a theme color, I agree with Dean above; Jelle Mees was very rude in his criticism. I happen to like the way the current configuration looks in Vista, though. A thought occurs immediately after my previous post; perhaps you could take a particular system color and find the most appropriate neutral gray tone, perhaps by reducing saturation? I’m not particularly familiar with coloring in your program, so I’m not sure how feasible that would be. Pick a color (I suggest 50% gray) and use that. Paint.NET is a graphics program. Its background has a certain utility. 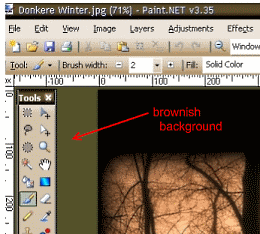 The background color should not be configurable or interpolated from system colors, just like the appearance of the brush tool’s icon is not configurable and is not interpolated from the system “back” button icon and the “open” button icon. 50% grey seems to be the popular vote. Then the question is, what exactly is 50% gray? Is it #808080, #7f7f7f, or some gamma adjusted value like #c6c6c6? I admit I miss the gradient myself it made Paint.net a little bit more special than other ‘dull’ paint apps, but functionality generally has to trump a few sparkles. This is a tricky issue as some would prefer the Vista grey, some 50% grey and some the system colour settings. Plus you might need to take in to account High Contrast mode and have special settings for that! And finally there is the issue that Paint.net tries to keep its configurability as close to zero as possible to improve usability. Looks like Photoshop CS3 uses #c0c0c0. Everybody seems to like 50% Gray. Why not 18% Gray? 18% gray is considered by many to be “average” IOW, If you took an “average” image (no obvious color biases, “correctly” exposed), and blended all the colors together, it would come out to, roughly, 18% gray. So make the background 18% gray to surround an image with a natural reference color? I’m not exact on the color, but I think it’s around #59636F. Adobe recently moved Photoshop to this darker color themselves. I think 50% gray is far too dark. It should be something between #a0a0a0 and #c0c0c0 (IMHO that’s really the upper limit). I’d be fine with something between #c0c0c0 and #c6c6c6. 7f7f7f is too dark: contrast between backround and bright toolbars / toolboxes becomes distracting. I agree that this should be standard on all systems. I’m not sure on color numbering (Is this pantone? ), but I personally would prefer a lighter grey. I also second Zyxil’s comment about the drop shadow. I would absolutely LOVE an option to toggle this setting on and off, as working with the end of images can be a bit difficult with the drop shadow. Thanks Again for a tremendous program. In order to apply your new color to the canvas, switch to the Fill tool (keyboard shortcut: “F” key), then click on the canvas – left-clicking will fill the canvas with your Primary color, while right-clicking will fill the canvas with your secondary color. I hope that helps straighten out your problem. If you have any more questions, I’d advise posting them on the official Paing.NET support forum, as you’re more likely to get a swift response. Luckily, Rick just made a new blog post, and I happened to see your question while I was here. * There are instances where changing the color boxes will immediately change the color of something on the canvas. This will happen when you’re using an “Active” tool – one that allows you to edit the parameters before applying the results. Such tools include the Text tool, the Gradient tool, and the Line/Curve tool. Thanks so much to both of you. It worked. Hey this could be an improvement. but can you just make the background zero like photoshop? It is like this. 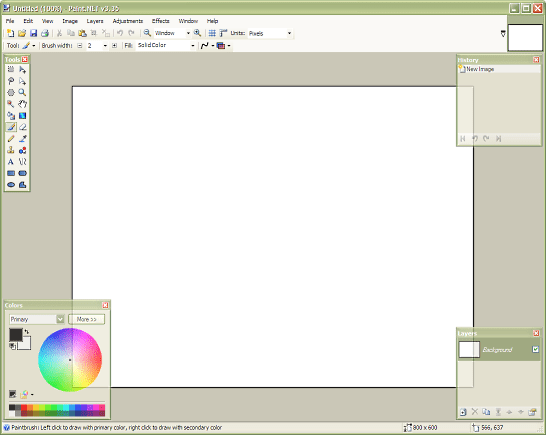 when you open paint.net the only thing you should see is the toolbar and the status bar.